Remembering a few simple points can help you make American Sign Language (ASL) handshapes like a lifelong signer. Handshapes are hand formations that you use to sign each letter of the alphabet; this is also called the manual alphabet. Your manual dexterity is like a voice that has the ability to sing, and it requires practice. Start with two-letter words and graduate to larger ones. 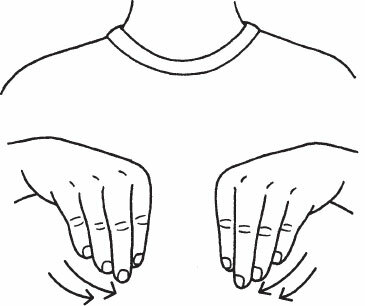 As you start getting the feel for fingerspelling, you’ll be using hand muscles that you didn’t know you had, so you may notice a little soreness. Handshapes are the individual letters of the manual alphabet, and fingerspelling is an action using the manual alphabet to create words. In your excitement to sign, you face the possibility of overusing your hands. Like that singing voice, your hands need a little break as they get ready for the next step. 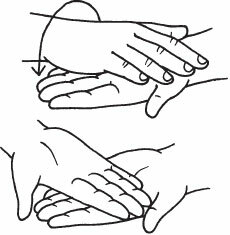 To find out how to keep your hands limber, search for “hand exercises” on the Internet or talk to sign language interpreters. For signing purposes, the hand you write with is called your dominant hand (some folks call it the active hand). The other hand is your base hand or passive hand. 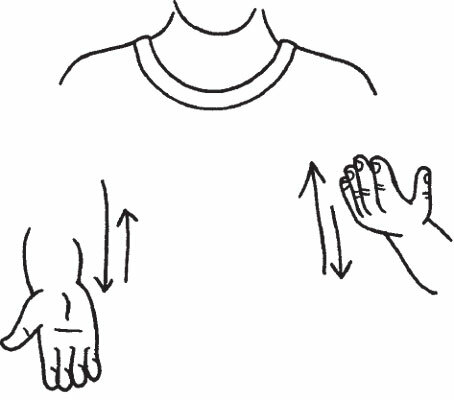 Here, the right hand illustrates the dominant hand, and the left hand illustrates the passive hand. So, in a nutshell, if you see a sign with the right hand dominant and you’re left-handed, use your left hand. It mirrors the active hand. It displays one of seven basic handshapes, called natural handshapes. The seven natural handshapes are the letters A, B, C, S, and O and the numbers 1 and 5. If you don’t use your passive hand for these handshapes, you’ll be breaking a rule in ASL. The Deaf person who is watching you sign may not know this particular rule, but they’ll be thrown off. Therefore, follow this basic rule and stay ahead of the game. 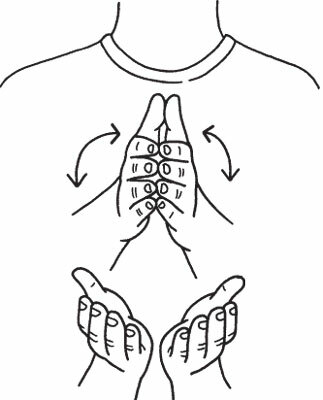 START: Place your active index finger between your index and middle fingers of your passive hand, and then turn the active index finger outward — it looks like you’re turning the ignition key in a car. BUY: Hold out your passive hand, palm up in the 5 handshape. Use your active hand as you would to hand money to a salesclerk. COOK: Hold your passive hand out, palm up. Lay your active hand across the top of it, palm down. Now flip your active hand over, then flip it back over, palm down. BOOK: Make this sign as if you’re actually opening a book. GIFT: Put both hands in front of you in the “X” handshape, but extend one a little farther away than the other from your body. At the same time, jerk your hands up a little bit, twice. MAYBE: With both hands facing upward, alternate them in an up down motion. STORE: Keep your hands in the same shape and move them back and forth simultaneously.